Trian Unloaded $82.5 Million Of Wendys Co (WEN). Is The Stock Overvalued? On February 14th, Nelson Peltz's firm Trian Fund Management filed its quarterly Form 13F regulatory filing. The filing showed that the investment firm held 39,035,921 shares of Wendy's worth $641.0 million as of December 31st. However, a new filing yesterday revealed that Trian Fund Management sold 5,000,000 shares worth a total of $82.5 million on Monday. This reduced the firm's position in the fast food company by 12.8%. The stock last traded at $16.26 as of Wednesday, up 18.8% over the last three months. 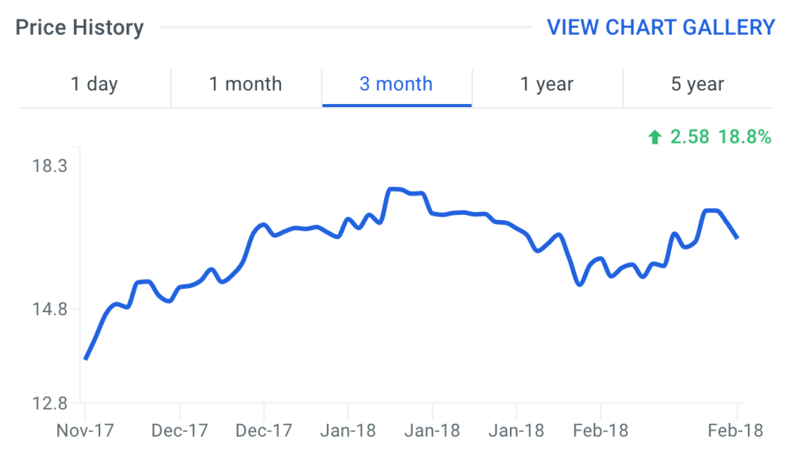 Although Nelson Peltz still holds a large number of shares, could his firm's recent selling activity signal that the stock is overvalued? Wendy's operates as a quick-service restaurant company worldwide. Analyzing Wendy's valuation metrics and ratios offers insight into why Trian may be reducing its stake. 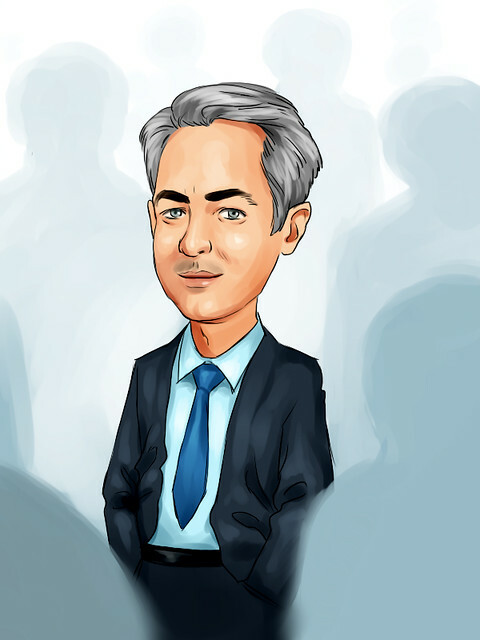 Analysts often look at companies as either thriving, surviving or dying. Analyzing a company's EBITDA growth can help distinguish between these stages. EBITDA growth compares a company's EBITDA from the most recent year (or quarter) to its EBITDA from the previous year (or quarter). Growth trends can typically signify whether the core business is doing well or not. 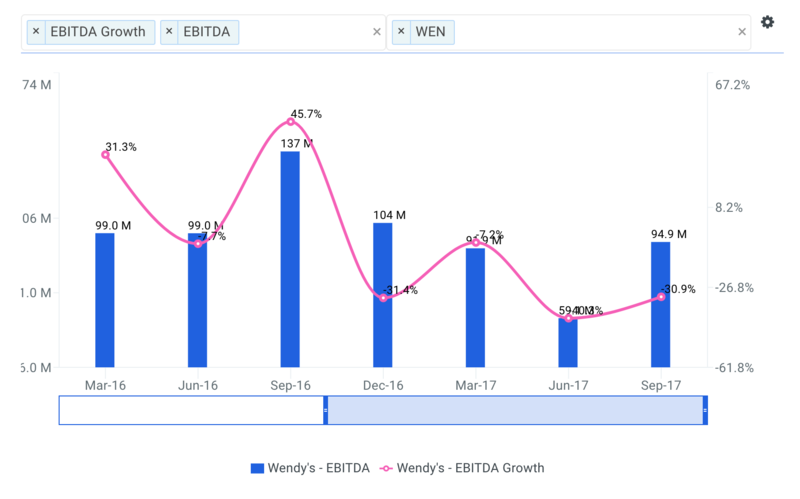 On a quarterly basis, Wendy's EBITDA growth has ranged from -40.3% to 45.7% over the previous six quarters. However, notice how growth has been trending lower in the chart below. This is generally not what investors like to see. Return on Invested Capital (ROIC) is used to evaluate the ability of a company to create value for all its stakeholders, debt and equity. The company's ROIC of 5.5% is below all of its selected comparable public companies: CMG (15.1%), DPZ (110.9%), YUM (28.7%) and MCD (29.2%). In general, a higher return on assets suggests management is utilizing the asset base efficiently. Unfortunately for Wendy's shareholders, the company's ROA of 1.6% is also well below that of its peers. In addition, finbox.io's average fair value estimate of $13.49 implies -17.0% downside and is calculated from 8 valuation models as shown in the table below. Each analysis uses consensus Wall Street estimates for the projections when available. On a fundamental basis, Wendy's stock appears to be trading at a premium to its intrinsic value. This could be a reason why Nelson Peltz is reducing his stake in the company. Valuation: how much upside do shares of Wendy's have based on Wall Street's consensus price target? Take a look at our analyst upside data explorer that compares the company's upside relative to its peers. 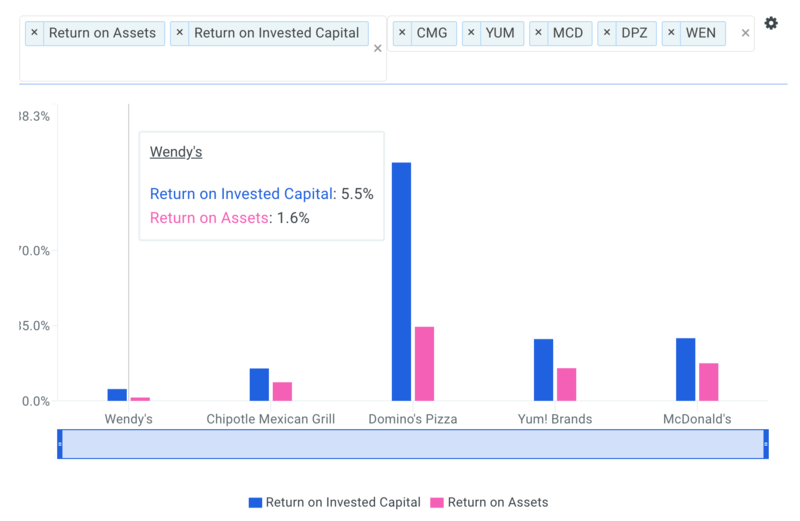 Risk Metrics: what is Wendy's financial health? Find out by viewing our financial leverage data metric which plots the dollars in total assets for each dollar of common equity over time. Risk Metrics: how much interest coverage does Wendy have? This is a ratio used to assess a firm's ability to pay interest expenses based on operating profits (EBIT). View the company's interest coverage here.